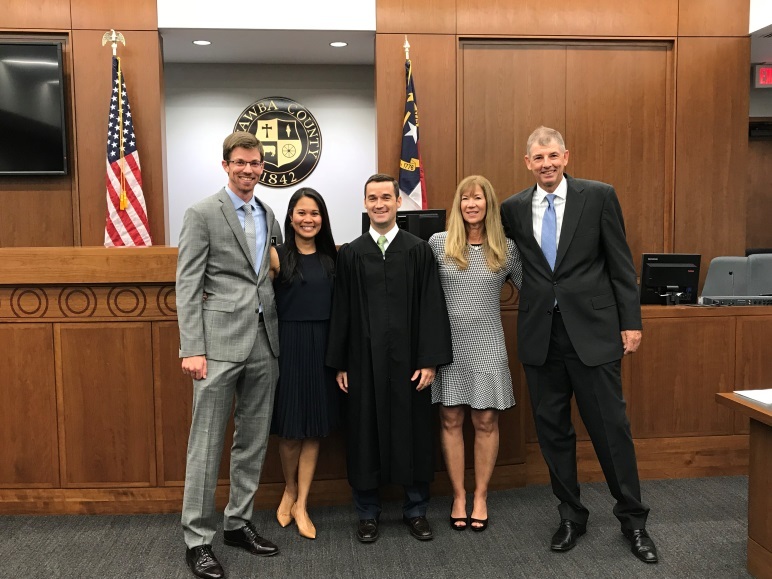 HICKORY—Jarryd de Boer, left, stands with his wife, Dr. Gabriela de Boer, Judge Clifton H. Smith, and his mother and father, Job and Jolyn de Boer, after his swearing-in to the North Carolina Bar by 25th District Court Judge, the Honorable Clifton H. Smith on October 8th, 2018. Jarryd is a graduate of the University of Denver Sturm College of Law and is employed by the Law Firm of Young, Morphis, Bach & Taylor, LLP. Jarryd and his wife Gabriela have settled in Hickory, North Carolina. Jarryd is originally from Hilton Head, South Carolina. Jarryd plans to focus his practice areas for now on commercial and business litigation, contract drafting or review, landlord tenant matters, small claims, and criminal misdemeanor defense. Young, Morphis, Bach & Taylor is proud to add Jarryd de Boer to their team. The firm’s mission remains steadfast to providing quality legal services in a caring environment while fulfilling their commitment to the communities in which they serve. Other attorneys in the firm are Wayne M. Bach, Terry M. Taylor, Paul E. Culpepper, Kevin C. McIntosh, Jimmy R. Summerlin, Jr., Timothy D. Swanson, John W. Crone, III, J. Steven Brackett, Jordan L. Faulkner, James R. Hawes, and Jessica M. French Watson. For more information about Young, Morphis, Bach & Taylor, LLP, visit www.hickorylaw.com.